The perfect 5 minute prep snack idea! This caramel apple no bake energy bites recipe is delicious, nutritious and perfect for school lunches. 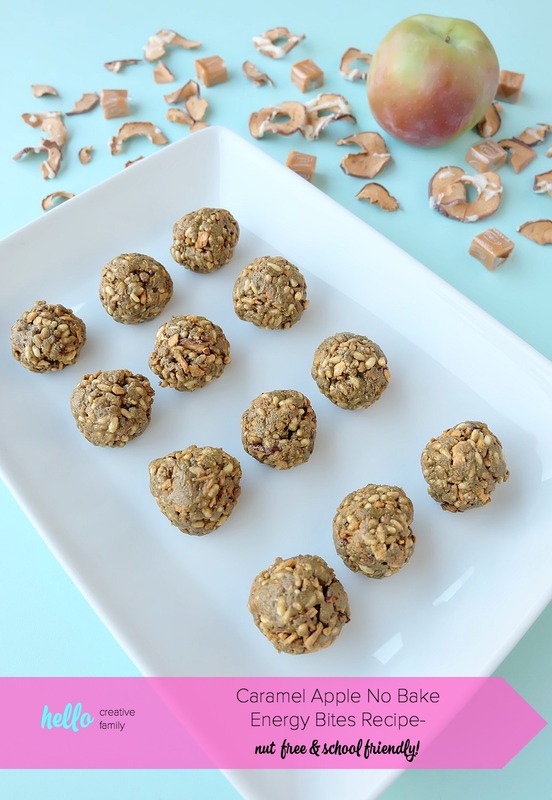 Packed with protein these nut free bliss balls are a family friendly snack idea. Get the kids to help make this easy snack recipe! 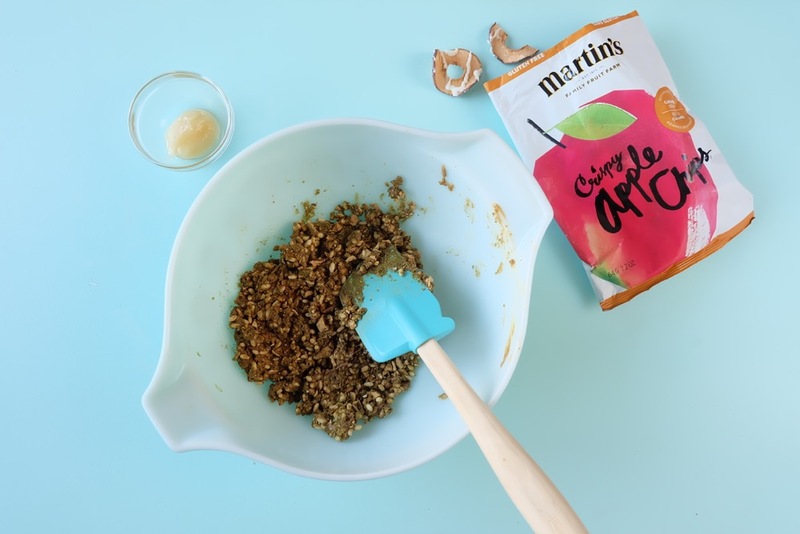 Disclosure: Thank you to Martin’s Apple Chips for sponsoring this recipe. 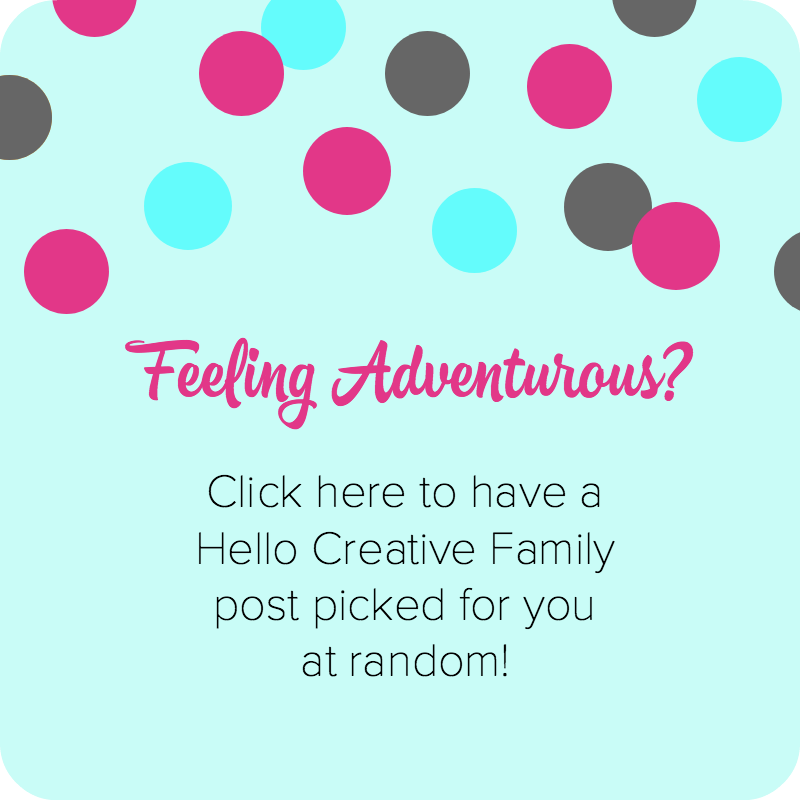 As with all articles on Hello Creative Family all thoughts and opinions are 100% our own. Raise your hand if you love making school lunches? Let me guess, your hand is sitting firmly in your lap. School started just two weeks ago here in Vancouver and the number one conversation I’ve been having with other parent’s on the playground after school is about school lunches. Every parent I talk to is searching desperately for ideas for their kid’s lunches. When I was a child we used to have sandwiches in our lunch each day. Sandwiches were an easy way for our parents to get all of the food groups into one meal and to make sure we had some protein to fill us up until the end of the day. Now, not many of my friends pack sandwiches in their kid’s school lunches, or if they do it’s once or twice a week. We seem to be in the age of bento box and thermos lunches and kids are wanting a lot more variety in what they eat. I actually think that switching things up and packing a variety of smaller food items in our kids lunches is a really good thing, but it doesn’t necessarily make it easy on the parents who are packing those lunches. I’m one of those lucky moms who somehow conned lovingly convinced her husband to be in charge of school lunches, however I still take part in the school lunch meal planning and grocery shopping. My kids are easily bored with having the same things in there lunch day after day, so before school started this year my daughter and I sat down and created a list of “main dishes” that she and her brother like along with healthy snack ideas. 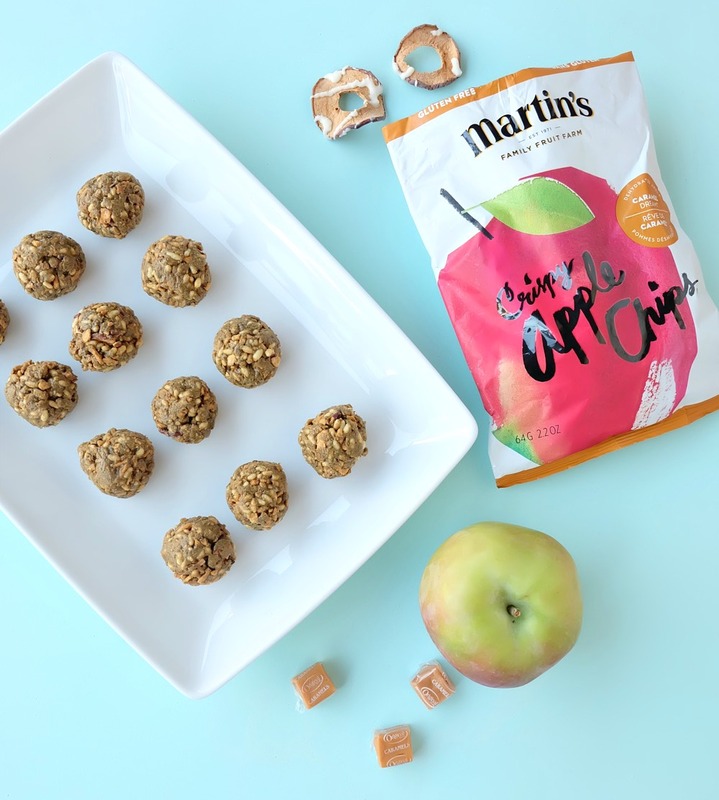 We have a handful of grab and go snacks on the list like fresh veggies, fruit and Martin’s Crispy Apple Chips along with snack ideas that I make up ahead of time (like today’s recipe). Each morning my husband picks 1 entree and a few of the snack ideas and voila– lunch packing is a breeze! 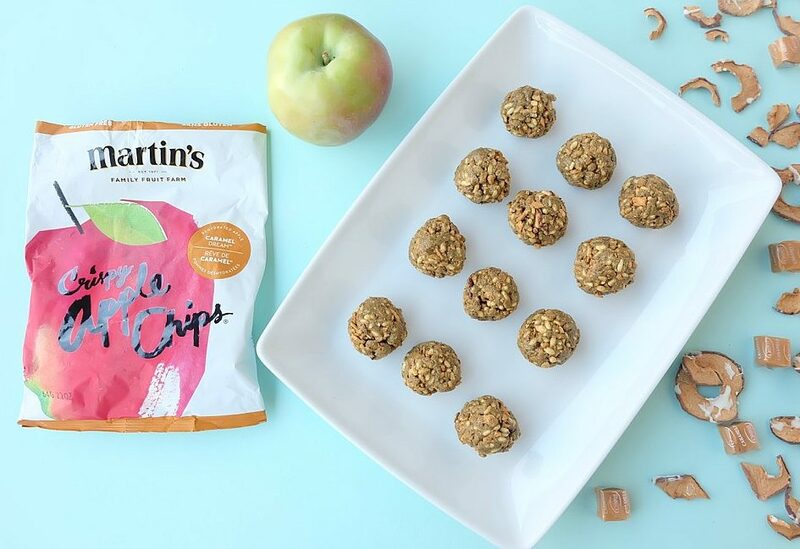 My kids love having Martin’s Crispy Apple Chips in their lunches. 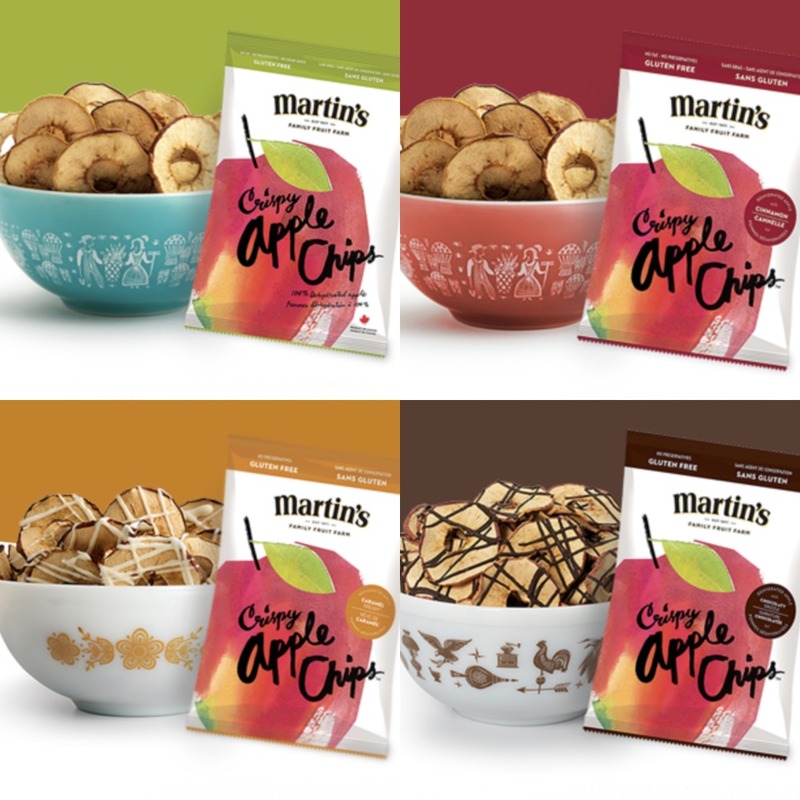 With four delicious flavors– Original, Cinnamon, Caramel Dream and Chocolate Drizzle there is enough variety to keep their taste buds interested eating them plain, but there are also a ton of other fun ways to eat Martin’s Apple chips too. My family loves dipping them in yogurt, spreading them with seed butter and made into energy bites like the ones that I’m sharing today! I’m also a fan of crumbling them on top of vanilla bean ice cream or dipped into baked brie– yum! I love that not only are Martin’s Apple Chips an easy and healthy snack choice, but also that I’m supporting a Canadian family run business when I purchase them. The Martin’s have been farming in Ontario since the 1820’s when they planted their very first apple trees. People who visit or live in Ontario can even go and visit the Martin family’s Orchard Market and pick up apples, apple sauce, canned pears, canned peaches, apple chips and more! 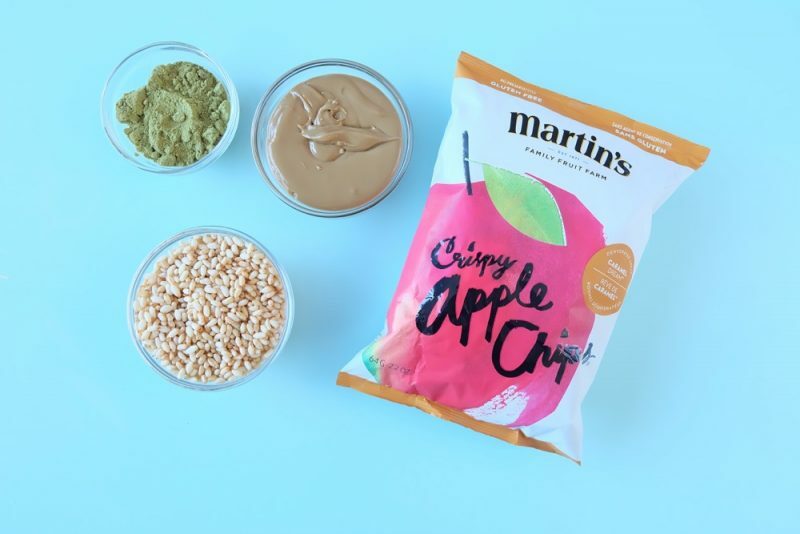 Don’t worry if Woolwich Ontario isn’t on your travel itinerary, Martin’s Apple Chips are available across the country at Costco, Starbucks, Sobeys, Winners, Bulk Barn, Farm Boy and many other retailers. For today’s recipe I wanted to create something fun and delicious that was school lunch friendly (aka allergen free) and packed with protein. Each of the ingredients was picked for a specific reason. I chose Martin’s Caramel Dreams Crispy Apple Chips for it’s sweetness, crunch and caramely goodness. I picked sunflower seed butter for the creaminess and nuttiness. I also love that it is nut free and therefore school friendly. I often use oats in my energy bites but this time around I decided on puffed brown rice because I love the pop that they give when you are eating them. It’s also a good source of dietary fiber. I added pumpkin seed protein powder to give these energy balls a punch of protein.Each Caramel Apple Bite had 9 grams of protein and 3 grams of fiber. 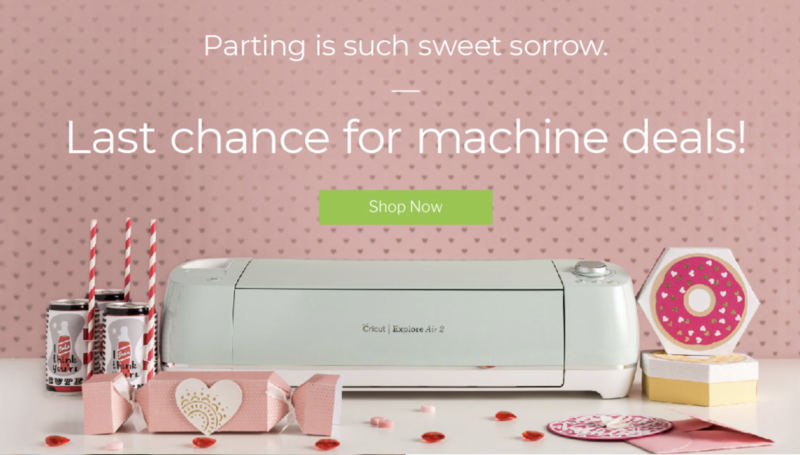 You and your kids are going to love them! 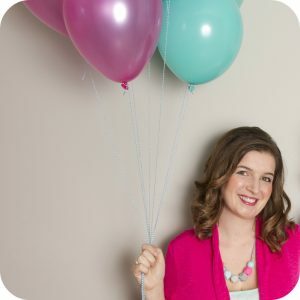 Read on for my Caramel Apple No Bake Energy Bites Recipe! Step 1: Put Martin’s Crispy Apple Chips in a ziplock bag and crush them with a rolling pin until they are crushed into small pieces. 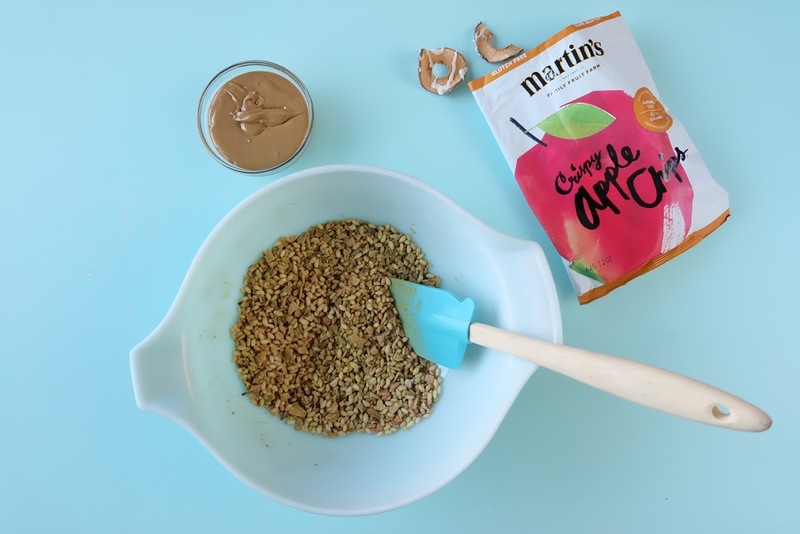 Step 2: Put Martin’s Crispy Apple Chips, puffed brown rice and protein powder into a bowl and stir together. Step 3: Fold in sunflower seed butter and stir until all ingredients are incorporated. Taste the mixture and if you would like added sweetness stir in honey. Step 4: Roll mixture into ping pong ball sized energy bites. 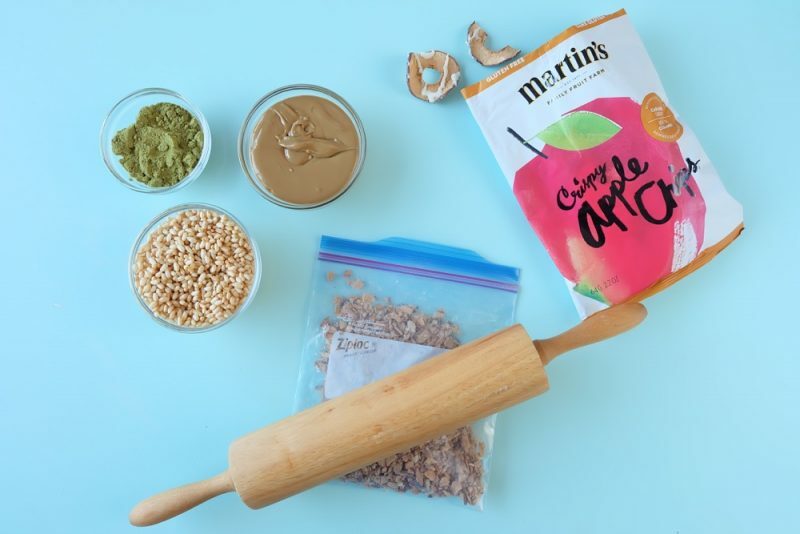 Put Martin’s Apple Chips in a ziplock bag and crush them with a rolling pin until they are crushed into small pieces. 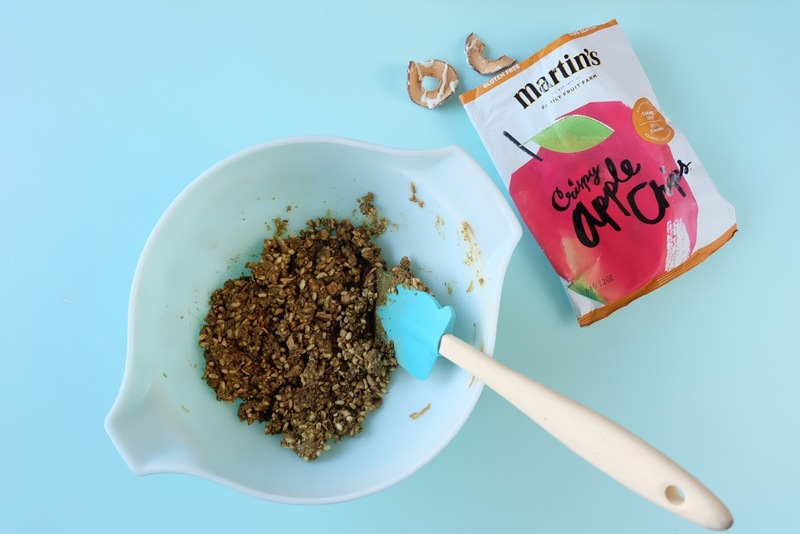 Put Martin’s Apple Chips, puffed brown rice and protein powder into a bowl and stir together. Fold in sunflower seed butter and stir until all ingredients are incorporated. Roll mixture into ping pong ball sized energy bites. 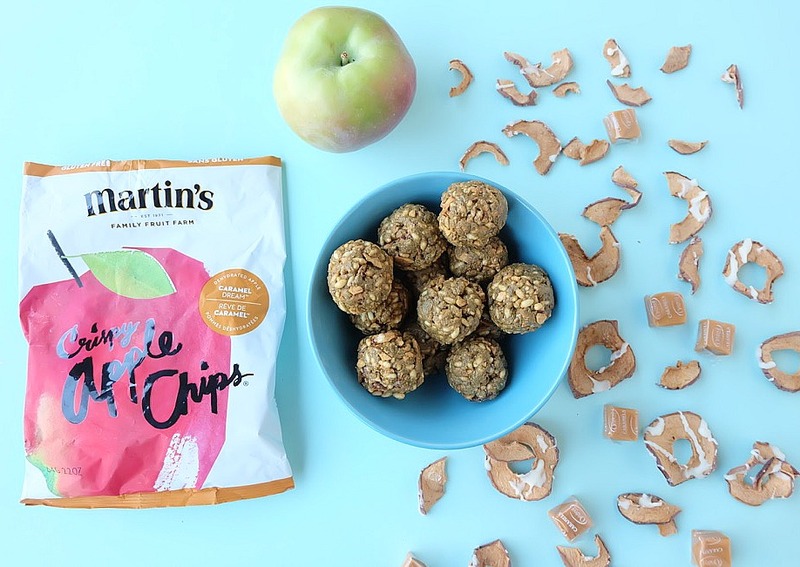 Disclosure: Thank you to Martin’s Apple Chips for working with us on this post. 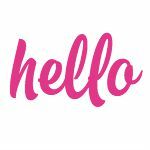 As with all articles on Hello Creative Family all thoughts and opinions are 100% our own. 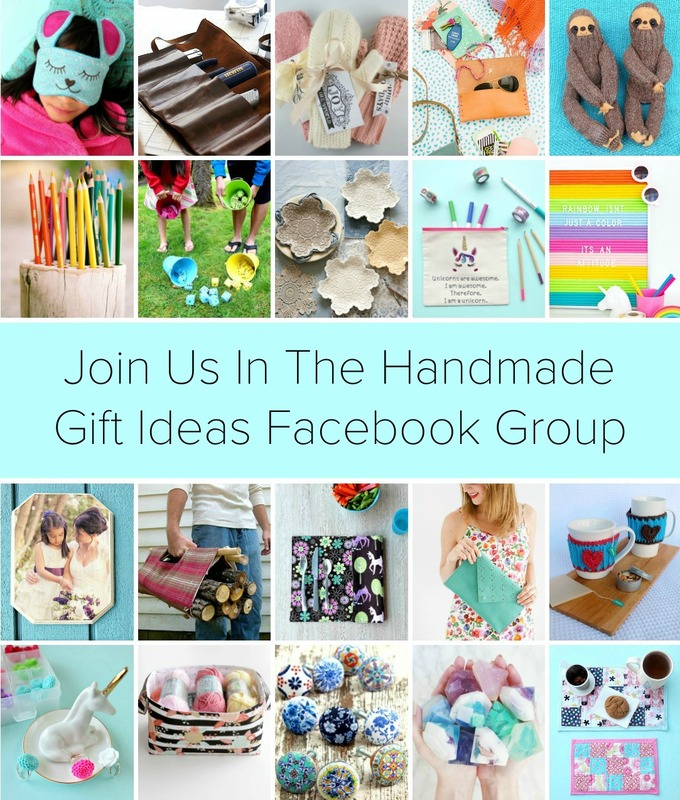 We only share things we love! Tell me… Do you struggle with figuring out what to pack in school lunches? What are some of your sure fire winners? Have you ever made energy bites? 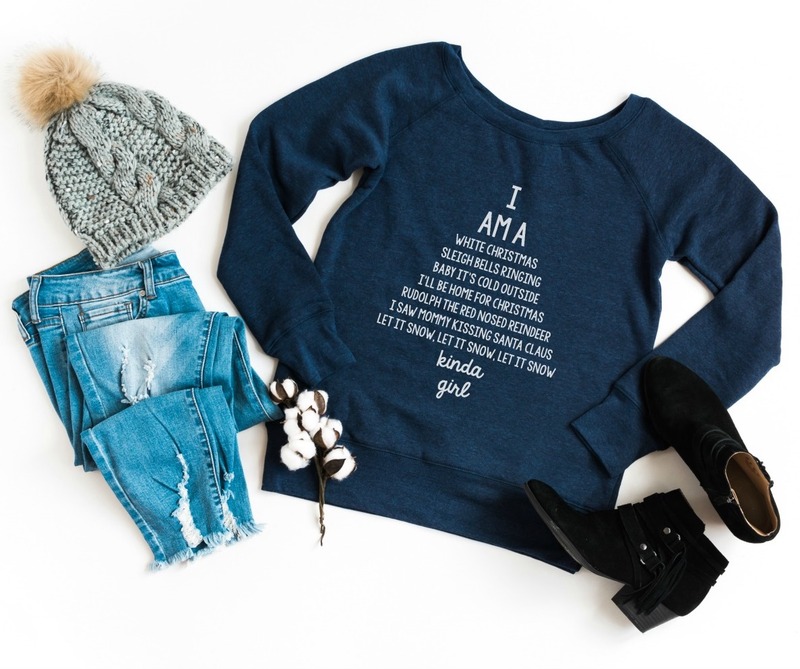 Thanks for sharing this Crystal! I’m sure my son will enjoy eating them. Have a great day ahead. These sound delicious! We love energy bites in our house! these look so yummy and easy to make! thanks for sharing!! I would love to try the apple chips- I’m sure my daughter would love em! This is a great snack idea!